This week, our apple tree was at its blossoming peak, I think. Gosh, I love flowering trees. The apple blossoms smell much better than the plum blossoms do, and I can spend a long time standing under it listening to the bees. In other backyard news, our Talavera birdbath and hummingbird feeders are back outside. We have had numerous hummingbirds already. I have seen a few bathing and/or drinking birds in the birdbath as well. Also, our irises and roses have buds! My trusty orange tulips are blooming now too. I didn't plant them, some previous owner of the house did. Most of the tulips I've planted don't flower. They just send up leaves. Two of them did bloom this year, both yellow. They were pretty but I love these orange ones best of all. The small Bears and I baked sugar cookies. I used a tried-and-true recipe, Betty Crocker's Best No-Roll Sugar Cookies. I started baking these when the LB was a toddler. They're so easy to make, especially with little hands helping. I make them fairly small, two-bite size like a gingersnap. Then it seems a little better when you've eaten six or seven with your tea. It was really like three or four normal-sized cookies, see. I've strapped my clodhoppers into a new pair of sandals. Well, two pair, actually. I ordered these Clarks sandals for myself in black and I liked them so much I went back for another pair in brown. They're very comfortable. This photo makes me dizzy; I think I leaned over too far to snap my feet. I bought a discounted bouquet of flowers at the grocery store this week. They had a shopping cart full of marked-down bunches, most of which still looked very nice. The floral clerk thanked me for buying a discounted bunch. I think they must have to throw them away if they don't sell. I was glad to make her job a little easier and I like my cheerful pink and red bouquet very much. I was pretty bummed last weekend when our fourteen-year-old toaster suddenly stopped working. I'm an avid toaster-user, are you? I think I must toast something almost every day. The dead one was a wedding gift and it lasted much longer than I expected it to. It was just a cheap Kenmore one (we registered at Sears for our wedding gifts. Good old Sears!). We ordered a new toaster from Amazon. It was confusing; toasters have become so fancy. I ended up ordering the most basic Black & Decker model. I love it! I'm going toast-crazy. I'm going to buy some Pop-Tarts tomorrow. Shh...it's a surprise for the uninitiated of our household. I'm playing with yarn again. I haven't crocheted since I finished Hensfoot almost a month ago and I'm starting to get a little twitchy. 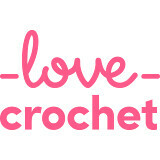 I really love to crochet, have you noticed? I don't know if I've ever mentioned it. Anyway, I finished my Retro Kitchen cross-stitch sampler this week (more on that soon) and now I'm starting to think about my next projects. 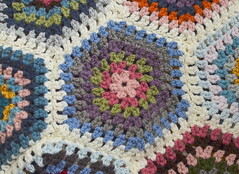 I have lots more stitching planned, don't you worry, but I'm also thinking crochet again. 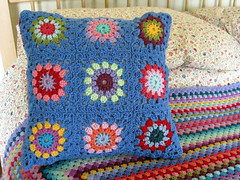 I want to make a larger blanket for our bed, possibly something with granny squares. I've ordered some more Stylecraft Special DK from Wool Warehouse and it should be here soon. I don't know exactly which colors I'll be using, so I'm just laying out yarn all over the floor. Complaints about tripping hazards have been duly noted/ignored. Finally, I had a wonderful package from the United Kingdom arrive in the mail for me. Jo, of the lovely blog A Whole Plot of Love sent me a copy of the April 2016 issue of Let's Knit magazine, along with the extras the magazine comes with, and a bag of Cadbury Mini Eggs. A couple of weeks previously, Jo had emailed to let me know that she'd been flipping through the magazine when she noticed that me and my blog were mentioned on the magazine's Bookshelf page, a place where notable crafty books, blogs and websites are featured. Jo offered to send me a copy of the magazine when I had trouble finding it in the craft stores near me. This was such a kind gesture and I appreciate a lot, Jo. How lovely to be mentioned! They said such nice things, too. It feels good to be noticed for doing things I love. Thanks, Let's Knit! I hope you have a great weekend! We'll be doing the usual housework and yardwork, with homeschool and music lessons thrown in. I think there may be some sort of takeout dinner, maybe Chinese, planned for Saturday for the Bear and me, for our weekly at-home date. I'm still watching Midsomer Murders (let's face it, I may never stop, what with the hundreds of episodes on offer), still reading Simple Nigella and now Jamie's Comfort Food, trying to get new ideas because eventually I'm going to have to make something other than toast. The weeks come and the weeks go, glad yours has been good. I love those first photo's, the blossom looks amazing against that blue sky. Your sandals look comfy and good idea to order / get another pair. Apple blossoms, how lovely. It will be another month at least before I see any around here. Enjoy your weekend Jennifer. I love apple blossoms! I also love Clark shoes and those sandals are cute. I may have to look for a pair. Their shoes are so comfortable. We had to buy a new toaster last year, so I know what you mean about how fancy the new ones are. Hooray for you and your blog being published. You deserve it! What a lot of happy here Jennifer. Today (my daughter's 20th birthday - yikes, how did that happen?) it is pouring and I think we are some weeks off seeing apple blossom, even the pear and plum trees are yet to put on their spring finery. Your sandals look lovely. I should replace an old brown leather Timberland pair soon and these will be considered. Have a great weekend. We're going to Canterbury to take our daughter and her boyfriend out to lunch. We've booked a pub on the North Kent coast overlooking the sea, but I fear it will not be sparkling blue today. Our cold backward Spring (do you know Thomas Hardy's poem "A Backward Spring"?) means I am making super progress with the Midsummer Sprigs sampler. Lots of good things happening at your house this week. I love your new sandals, I'd have done the same and bought another pair too, it's always good when you find something really comfy and that you like. How lovely to be mentioned in Let's Knit, Jo's such a generous blog friend, I'm glad you managed to get a copy. I'm so excited that your (obviously fantastic) blog was featured in a magazine! That's brilliant, and how kind of Jo to send you a copy. Yay, your gorgeous bird bath is back :)) And apple blossom, so sweet and romantic, I think. Your sandals look excellent, just what I need to wear most of the time also! Congrats on the magazine mention....yes those sandals look very comfy...and I absolutely love that bird bath! Beautiful photos. Especially love the colorful birdbath. It would seem to me that the magazine should let you know if they are going to make mention of you. What if a blog friend had never seen it? You would never have known and that would be a shame. Happy crocheting! Fantastic bird feeder. Did you paint that? Love the photos. Do do do do do...da da da da da. Love Midsomer Murders, bought all the DVDs, but now we have Acorn TV and they have all of them on there. How nice to be featured in a magazine. Tulips won't bloom again for me, they'll come up, but no flower. You are such an excellent photographer. Your ability to photograph your world is remarkable. Plus your other work is lovely. BTW, I also love to stand under my fruit tree (old old apricot) in White Rock NM and listen to the bees. It is a wonderful sound. I am in love, too, with your bee on the apple blossom! These captures are greatly admired. The birdbath is so lovely, too - it gives me ideas for a second birdbath I want to install in the garden. Thank you for your blog that is a pleasant place to spend a few minutes... or an hour... after some time I must go out looking for bees to photograph. Congratulations, what a thrill to have your beautiful blog mentioned in a magazine. Such pretty apple blossom. Your apple blossoms are so pretty! I bet the bees love them (which is a good thing). Love your new sandals. I agree Clark brand shoes are very comfortable. My feet always hurt now for whatever reason, so comfy shoes are a must for me. I just have a 2-slice toaster and don't use it often, as I don't eat much bread. Congrats on being featured in that magazine! I'm surprised they didn't notify you ahead of time and send you a copy. Congrats on being mentioned in that magazine!!! That is so exciting. No wonder you are loving Friday's!!!! Your blossoms are beautiful, it is a perfect time to be outside. I just love to read your blog Jennifer. It's such a happy one and today's was not a disappointment at all. Far from it. Love the blossoms and flower rescue. :-) Your sandals looks so comfy, it makes me want to find some for myself. A write up in a magazine! How spectacular! Oh my goodness. I feel like I know someone famous. Well done. I hope your weekend is a lovely one. We're in town long enough for church and to mow the lawn and it's back to the lake for another day or two. Fun times! You have shared a lovely post of your week and photos. Love your pretty blossom flowers and the happy bee. Congratulations having an article in the magazine and that is so exciting! You were in a magazine! That is so awesome! You are famous now!! all our cherry blossom withered away to an early death with the sudden freezing temps :( Hope some still manage to bloom once the weather gets better. Congrats on making it into the magazine.. how cool is that! Aren't the blossoms lovely? I wish they'd hang around longer. What a lovely surprise for you in regards to the magazine mention. And how kind of Jo to send you a copy. Thoroughly deserved of course. I still can't get over the fact that you have hummingbirds visit your feeders. It sounds so exotic! All I get are crows. What a delightful post, I really enjoyed it. It sounds like life is good in your parts. How fantastic to get a mention in a magazine, brilliant what a great surprise! Hi Jennifer, how exciting to get a mention in a magazine, you are famous now! Kind of Jo to send it through to you too. I love the apple blossom photos. And Clarks shoes as they do half sizes here, not that many places do. Enjoy your new toaster, what will the Bears make of the pop tarts?? Wow, what a great mix of things you're loving. Congrats on the magazine mention -- that's VERY exciting! And fun to have a new toaster -- or any new appliance, really, LOL. Did the littles like the poptarts??? Did you get a toaster big enough for bagels? Our toaster is pretty old by now and I wish it were wide enough for bagels!